If you ask me my favorite hobby or holiday, the answers will always be the same. When you combine these two favorites of mine together, it is no surprise that teaching Holidays Around the World is something I truly enjoy. I have heard other teachers say before that they love it too, but don’t have the time because of Common Core and all of the standards they need to focus on. That is why I designed a holiday unit that is completely aligned with Common Core state content standards. The fun elements that I’ve always loved haven’t been lost, but there is also a clear focus on reading informational text and writing opinion pieces. Let’s humor me for a moment though and start off with the fun elements. First, the kiddos pack their bags! Each student is given their own suitcase, which is used to store all of their mementos from their travels. The first items that go into the suitcase are their passport, map, and travel guide book. Their passport, complete with personal information and photo I.D., is where they keep the stamps they earn every time we visit a new place. We also locate each place we travel to on the map, and color code it using the legend. When I say “visit” or “travel to” a new place, I mean that we read about it in our travel guide book. We do Close Readings of up to 10 different parts of the world. We read each passage more than once, whether it's whole group, partner reading, or independent reading. As we re-read to dig deeper into the text, annotations are used to help with their understanding. Students circle important or unfamiliar words and discuss their meaning, draw stars next to main ideas, underline key details, and use symbols to indicate questions they have or connections they've made. And so we take off on our next adventure: the pre-writing process. They brainstorm some of the favorite places they’ve visited on a circle map and narrow it down to one top favorite. Students plan out their rough draft by making an outline. It includes an idea for a topic sentence to state their opinion, reasons and examples to support it, and a conclusion sentence to restate their opinion in a new way. As they are coming up with their reasons and examples, they use the page from their travel guide book to refer back to. I remind them that writers use evidence from the text to help support their opinion. Simple words or phrases are sufficient during this point of the writing process. It's just the bare bones, and their ideas get flushed out and stretched into complete sentences during the next phases. For now, it's just a way for them to get their initial ideas out on paper in an organized manner. Now students take those ideas and form them into more detailed and complete sentences on their rough draft. For this rough draft stage, I encourage them not to get hung up on spelling and making their sentences perfect, but just to concentrate on stretching their ideas into sentences and using their outline to help them stay on track. The x’s on the rough draft template are meant to remind students to skip lines. Skipping lines leaves them more space for when it is time to focus on editing for spelling and other errors. I then show students how to go back and self-edit their paragraph using a checklist and these editing marks. The checklist is a powerful tool for helping kids move toward being more independent in editing and revising their own writing. I laminate the checklists so that they can check off questions with a white board marker as they go. They use a "correcting pen" (any ballpoint pen) to go back and make their editing and revision marks right onto their paper. Once they have self-edited to the best of their ability, we hold a writing conference where I sit down with them and assist with any further needed editing and revising. I go through the check-list again with them, discussing what they found on their own and if there was anything they missed. They still get that guidance and feedback about their writing without the teacher just editing their writing for them. Now they are ready to publish their writing with a final draft! They get the special publishing paper for the specific country or continent they chose. I like that not everyone has the same paper, and it's exciting seeing all of the different places around the world that they choose. Even just visually, it is a great celebration of diversity in our classroom community. If you are interested in taking your students on this excursion around the world, this resource can be found through Life Between Summers on Teachers Pay Teachers. If you’re looking for more writing lesson inspiration for elementary, don’t miss these posts! 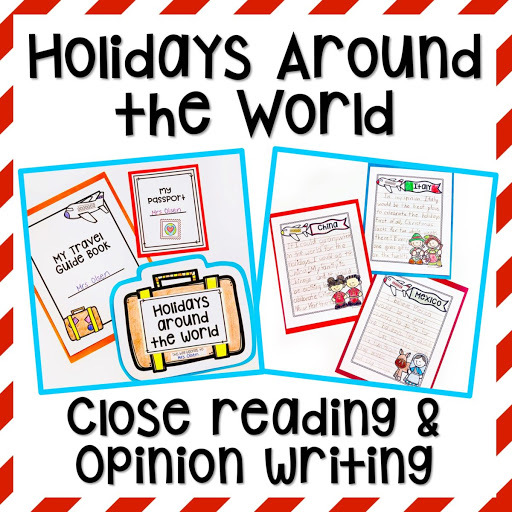 Whether this might be your first time bringing Holidays Around the World into your classroom or you’re just looking change it up this year, hopefully you find this unit to be a nice mix of standards-based learning and good old-fashioned holiday fun. In keeping with the travel theme, I like to think of it as the best of both worlds! I’m Shannon, founder of the elementary education blog and TPT store Life Between Summers. I’m also a teacher, a wife, and a mom, which means that I’m tired and happy. I have been teaching second grade for 13 years. The thought of changing grades pops in my head from time to time (like the moment when a kid is tattling on his friend for tattling on him), but it is my favorite age and I know it’s where I’m supposed to be. When I’m not doing what I love in the classroom, I’m either enjoying family time or planning my next vacation. Travel has been a passion ever since I studied abroad in Italy and made a vow to visit at least one new country a year (even with toddlers in tow). I have since traveled to over 30 countries on 6 continents and always look forward to new adventures.